A few days ago I joined 'We love Etsy' and 'Indiepublic'. I use a different avatar there. A few years ago I had to make an assignment for my ceramic evening class: as smooth as glass. Design a series of small, fluent shapes. These shapes can be part of an entity what concerns shape but it doesn't have to be the aim. The shapes need to be polished, several times to make the surface smooth as glass. When I heard the words smooth and fluent, I immediately associated the words with the figures I remembered from my childhood: Barbapapa. I love smooth, fluent shapes. They invite to touch. There are no sharp edges. 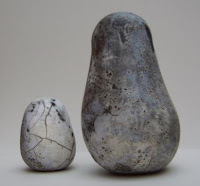 My shapes have been 'naked raku' fired. A technique where at first you give the shape a very thin layer of clay slib, in this case it was a gray slib and then you put the glaze on top of that layer. The shape is fired in an oven with a maximum temperature until 880°C. Then one takes the shape out of the oven and sprinkles it with drops of water. The glaze breaks and when the shape has cooled down, it can be removed. You then have a matt piece of ceramic. Would you like to read more about Barbapapa en Co?